Bee on a Bottle Gentian flower. Extension Educator Julie Weisenhorn shows you how to do this in a few simple steps. One of tips Julie suggests is creating a bee "hotel" for native bees. Roughly 60-70 percent of bees nest in the ground. The other 30 percent are cavity-nesting, using hollow plant stems or holes in wood. Q: Is fall the right time to buy or build and install a bee house? A: Anytime is fine for hanging them. Q: What features should I look for if I'm buying a commercially available mason bee house? A: It should be a minimum 8 inches deep with removable or cleanable tunnels. The bee house should be anchored on a tree, fence, deck or house, in a spot where it's exposed to morning sun and afternoon shade, but hung away from vegetation. 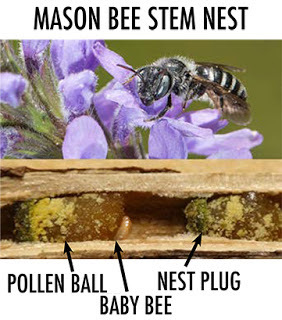 Mason bees are one bee group that makes nests in hollow stems. Elaine notes it may be better to create a natural habitat for the bees, rather the houses, unless you are trying to study them. She says there is some evidence that the artificial nests tend to support more non-native bees and parasites than natural nesting areas. Q: If I make my own with the hollow stems out of dead plants for the bees to nest in, how long do the stems need to be? Q: Can I just tuck a bound bunch of dead hollow stems in the crotch of a tree--is this a good thing to do? Q: Are homemade bee "hotels" out of blocks of wood drilled with various holes valuable? A: They're fine as long as they are cleaned out every few years. You need to take nest down and leave it down for a year so bees can emerge, clean out the next fall and then can be put back up. Fall is also a good time to get seeds out for your bee lawn. Over-seeding or seeding in bare spots in the lawn with flowering ground covers like white clover and prunella can add ecological value to your lawn. "Ground nesting bees" "Pollinator Habitat" "Pollinator Plants"